Niche-ify your niche, right? But can you go too far? I kick off the first episode with new co-host, Ben, discussing when and how to hone down your specialization. Getting more specific can limit your reach, but at the same time it improves the connection you make with that smaller audience. This can help lower your competition, increase your effectiveness, and even result in being more profitable. 07:15 As long as the market supports it, there’s nothing that is stopping you from specializing further. 07:37 However, if you are going to specialize to a high degree, you should be using some form of The Overlap Technique. 07:49 As an industry grows, there continues to be increasingly greater room for specialization. 07:58 When you’re starting out, it’s a good idea to stay contextually broad within a given industry. 09:30 It’s not just the product or service that can be specialized—you can also specialize the kind of person or audience you’re trying to reach or market to. 10:35 Be well rounded, but focus on one thing at a time. 12:02 It’s easy to be fooled into settling for something “good”, when you’ve never put forth the effort required to see what “best” looks like. 13:58 I was balancing all of these things with super-human amounts of effort and time, and that resulted in all of those things being good. But that was the problem. They were good. Not best. 14:53 An important distinction about “effectiveness” at just one thing at a time. 16:37 It’s this “effective as you can possibly be” part that I had a hard time with. 16:46 I was ok with 80% effectiveness at a bunch of things at the same time. I thought that was good. And maybe it is good. Maybe it was impressive. But I could be better at any one of those individual things if I gave it my focus. 17:04 While a lot of the market won’t recognize the difference between 85% work and 95% work, you can break into a new realm where the few people who do recognize that difference in quality will happily pay you for it accordingly. 22:20 The point at where I really started experiencing recognition for my work. 23:56 The key is showcasing what you want to specialize in. 29:23 I’ve yet to hit a point where I’ve stopped specializing. I’ve yet to hit a point where I’ve stopped my specializing. If doing less of one thing and more of another makes you happier, then I think you should hone in further once you’re to the point where you would be able to continue supporting yourself with it. There’s always going to be someone interested in that specific thing you’re offering. Yes, it will be fewer people, but they will be much more targeted. 34:56 Just start doing. Remember: You can always scale back up as needed if you find that you went to far too soon. 35:28 Splitting off pursuits into separate ventures. 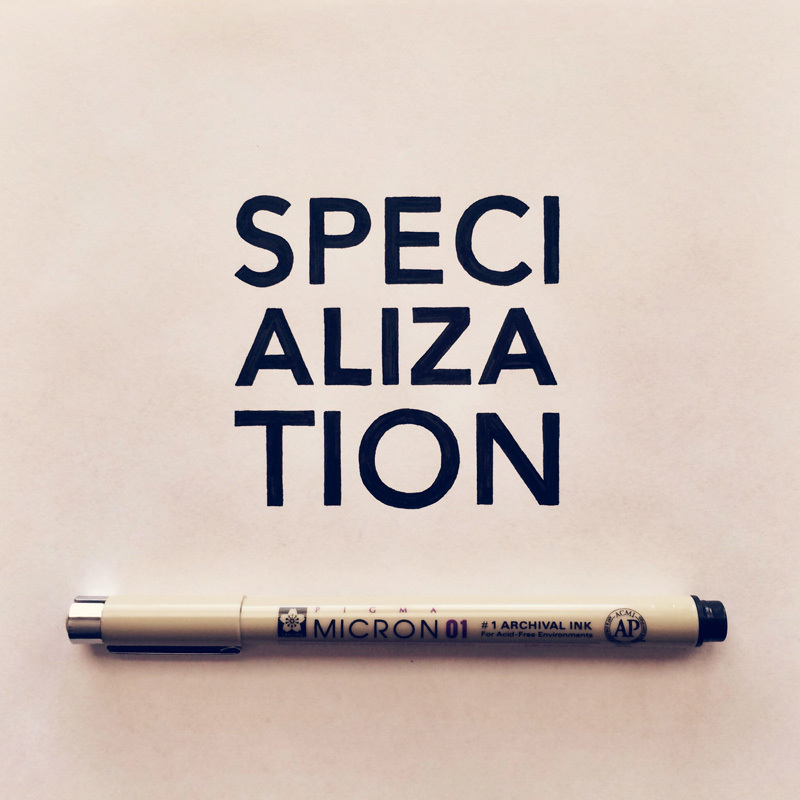 Specialization is a gradual process. You can specialize as far as the market will support. Start contextually broad, and hone in as the industry expands. Specializing doesn’t mean you can’t do other things. It’s about showcasing the work you want to specialize in. It's easy to be fooled into settling for something "good", when you've never put forth the effort required to see what "best" looks like.